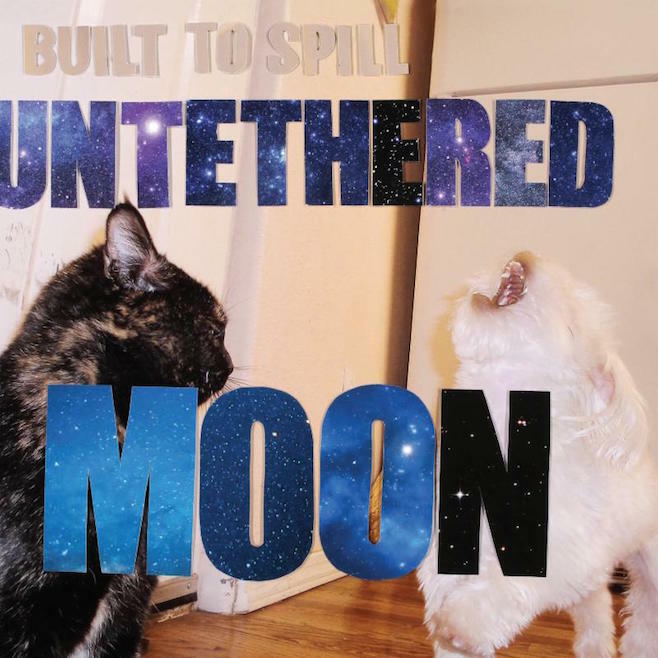 During the last press go around Doug Martsch, the only true member of Built To Spill, said that no one was in a hurry to hear any new BtS albums. He was right and after the underwhelming There Is No Enemy back in 2009 there didn't look like there would be another one, and that was OK. It seemed the band would tour when Martsch felt like it and play their old, fantastic, indie rock back catalog to fans. Now along comes Untethered Moon and maybe that unexpected nature gives it an edge, but for whatever reason the album sounds better, more alive, then anything Doug and backing players have produced since 1999's Keep It Like A Secret. Adding a new rhythm section of Jason Albertini on bass Stephen Gere on drums could also be a reason for the born again feel but the group still revolves around Martsch's otherworldly guitar offerings, quirky timings and laid back yet yearning vocals and lyrics. Opening with "All Our Songs" Martsch takes his knack for writing about writing music (see the excellent "Joyride") and constructs an extremely engaging musical journey. Reflecting on his personal tunes, tons of guitar styles/pianos/rhythms become entwined in an inventive fashion. There is a crazy ending to things (an occurrence throughout the album) that builds to a driving solo. That songs about songs thing shows up again in another highlight track "Some Other Song" that includes great lyrics ("I still don't know/how to fall apart") in Doug's patented vocal style, directly reflecting on the bands back catalog. Production on this disk really stands out, glorious feedback, guitar runs, and deep bass match well with crisp drums; those duties were handled by Martsch and Sam Coomes of Quasi. The country vibe of "On The Way" can gain all the bands off kilter Neil Young comparisons this go round, while the snake driven guitar lines of "C.R.E.B" and the poppy drive of "Another Day" both work wonderfully. The first released track "Living Zoo" cooks at the intro with zig-zagging six strings before a pop laden vocal that contemplates man's animalistic side. Other tracks like the pairing of the short "Horizons To Cliff" with the rising "So" work very well in the full album format. The disk closing "When I'm Blind" ends the album on a cosmic high, driving bass and guitar soloing which made Martsch so engaging in the late 90's come home again in glorious fashion. While he is correct BtS doesn't need to make new albums, after listening to Untethered Moon fans of engaging guitar dominated indie rock will be damn glad that they did. This surprised us, we had written off Built To Spill, but this here is good stuff. Dylan Cover #183 Angelique Kidjo "Lay Lady Lay"